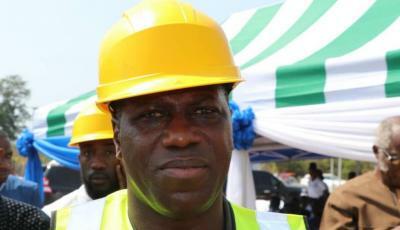 Topics > "APC's Bureaucracy Halted the New IPAM Campus," FEMAD Construction Boss! APC's Bureaucracy Halted the New IPAM Campus," FEMAD Construction Boss! The Femab Construction Group Managing Director has slammed the APC govt for dragging its feet for constructing the new IPAM campus. Femab Construction Managing Director, Mr. Abiodun Aguda made this startling revelation recently when the Chief Minister Professor Dr. David John Francis graced the occasion by turning the sod for the commencement of the new campus for the Institute of Public Administration and Management (IPAM) at Bureh Community in Freetown. (Photo: Chief Minister Francis during the sod turning for IPAM). Mr. Aguda expressed delight to have met a government which is ready to embrace development. He said a project which they struggled for with the past APC administration for over two and half years was approved by the New Direction SLPP government in six weeks with no conditions attached. As the SLPP Chief Minister David Francis turned the sod on the new IPAM Campus on January 24, 2019, on behalf of President Julius Maada Bio, he said it shows the President's focus on education in the SLPP New Direction. 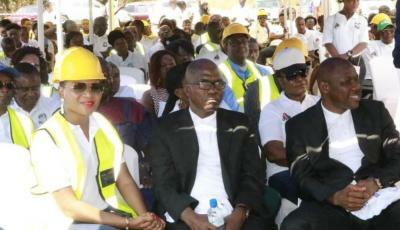 Speaking further, the Chief Minister thanked the leaderships of the University of Sierra Leone, the UBA and Femab Construction Company for their efforts in making the project a reality. (Photo: Participants during the FEMAD/IPAM construction meet). He said that was a demonstration of the President and the New directions focus on education. Stating that education is not an end in itself, its a means to an end, and that end being sustainable development. He said the government is prepared to drive the process of the transformation of higher education. The Femab Managing Director, Mr. Aguda also disclosed that the 66 acres of land will be used to construct a new IPAM campus that will accommodate three thousand five hundred students. Other facilities included as stated was staff quarters, a football pitch, a basket ball pitch, a clinic, a secondary school, primary and nursery schools, an entertainment and business center. He said the project will be implemented in three phases. The first phase will be completed in a period of two years. He finally thanked the people of Sierra Leone for voting a serious and corrupt free government. He assured the government that the company will deliver to the people's expectations. The Minister of Technical and Higher Education Professor Gbakima said it is necessary for the government to make provisions for higher education that will accommodate the high number of enrolment the free education created for secondary schools.